Manual "Lead in the construction industry"
Hardly any material can be used so flexibly and in such diverse ways on roofs and facades as rolled lead. This material is easy to weld, solder, fold and beat. 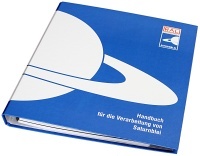 The techniques for application are published in the manual "Handbuch für die Verarbeitung von Saturnblei". The complete manual contains 4 parts and costs 25 Euro plus VAT. Alternatively you can order only part 1 for 7 Euro plus VAT. The manual is only available in German.